Giving medications by injection requires the use of the right syringe, the right needle and the right part of the body. Syringes are also used to remove blood from the body during blood donation, for blood samples and to transfuse blood into a patient. Syringes are made up of a round cylindrical barrel, a close-fitting plunger and a tip where the hub of a needle is attached. They come in a number of sizes, ranging from .5 ml to 60 ml. A 1- to 3-ml syringe is normally adequate for injections given into tissues under the skin, also called subcutaneous injections, or injections into muscle, also known as intramuscular injections. 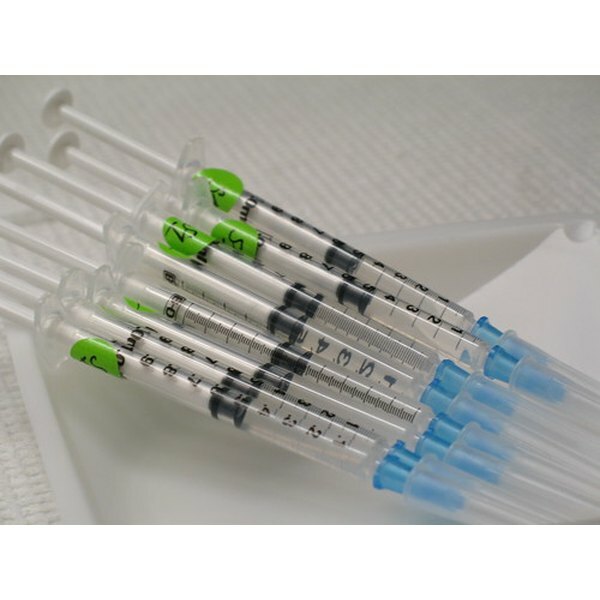 Larger syringes are used to add medication to intravenous lines and irrigate wounds. Syringes are generally classified as Luer-Lok or non-Luer-Lok syringes. This classification is based on the type of syringe tip. Luer-Lok syringes have tips that require needles that can be twisted and locked into place. This design prevents the needle from accidentally slipping off the syringe. Non-Luer-Lok syringes have tips that require needles that can be pressed on to the tip of the syringe without being twisted into place. Insulin syringes are small in size, they hold between 0.3 and 1 ml of medication. These needles are not calibrated in milliliters, they are calibrated in units. Most insulin syringes are calibrated up to 100 units. Insulin syringes are designed for self-injection and are used to give subcutaneous injections. Tuberculin syringes are used for tuberculosis testing. The fluid they contain is injected right into the skin. This syringe is small and is calibrated in milliliters. It has a long, thin barrel with a preattached needle. The tuberculin syringe can hold up to 1 ml of fluid. Even though this syringe is small, it cannot be used to give insulin. Most needles are made of stainless steel. The needle is hollow with a hole in the middle and has three parts: the hub, which fits on to the tip of the syringe; the shaft, which is the long length of the needle; and the bevel, which is the slanted tip of the needle. The bevel creates a narrow slit or hole in a persons skin through which the fluid in the syringe is injected into a person. This slit closes once the needle is removed from the person's skin so there is no leakage of medication or blood. Long-beveled tips are sharper and narrower, which reduces discomfort when it pierces the skin. Needles are differentiated based on their length and diameter. The length of needles range from between 1/2-inch to 3 inches. The diameter of a needle is measured in gauges. A 25-gauge needle has a smaller diameter than a 19-gauge needle. As the needle gauge gets bigger, the needle's diameter gets smaller. Two different needles may have the same length and have different gauge sizes. Needle gauges range from between 7 gauge being the largest to 33 gauge the smallest. Gauge selection is made based on the thickness of a medication to be given. If the medication is thick, a needle with a small gauge and big diameter would be the needle of choice. Intramuscular medications are given with long needles, while subcutaneous medications are given with shorter needles.